Hello to my fellow Warseers, and thanks for taking an interest in my first project log. Some of you may have seen some snaps of my Blood Axes floating around on the “Who Loves Orks?” thread. I’d been meaning to do an Ork army for quite a while – I’ve been in this hobby for at least a decade – but never really got around to it, until last summer when I finally had a spare bit of time and cash. Grimtuff, Nob upgrade (16), Big Shoota (12), Power Klaw (25). Muggrub, Nob upgrade (12), Big Shoota (12), Choppa (2), Bosspole (3). Gobshak, Nob upgrade (12), Big Shoota (12), Choppa (2), Bosspole (3). Badrot, Nob upgrade (11), Rokkit Launcha (8), Bosspole (3). Is this the most effective Ork list ever devised? Erm, probably not, but I’m trying to stick with the Blood Axe character, and I’m pretty happy with the choices I’ve made. I also have a FW Fighter-Bomba (piloted by the legendary “Squiggles”) and a couple of Dreads which I’ll use to expand the list up to 2k. Alright, that’s enough chat, onto the pretty pictures of all the models that I’ve managed to finish so far. This is Kaptin Nuzzgrond, my Warboss. He was actually my first large-scale use of green stuff, and I think he turned out pretty well. 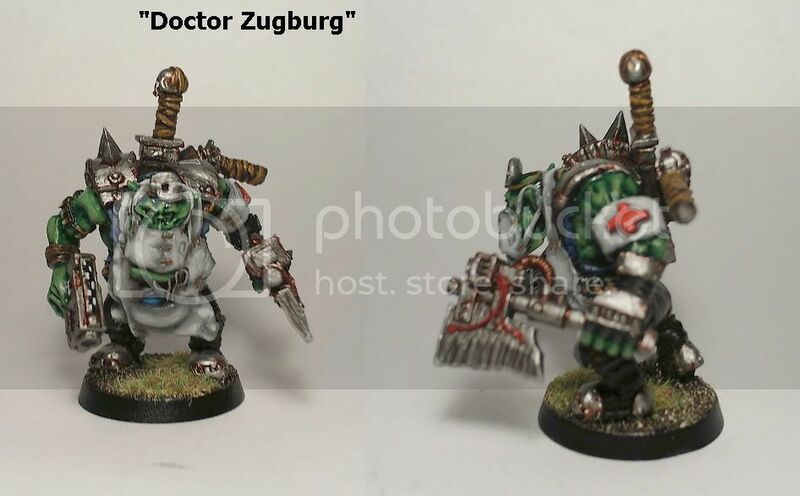 Next we have Doc Zugburg, my Painboss. You’ll notice his weapons are different from those mentioned above as he was built for the previous version of the army list, so these will be changed eventually. I also want to redo the mirror on his head to get it a bit more circular. Any success with Blood Axes?